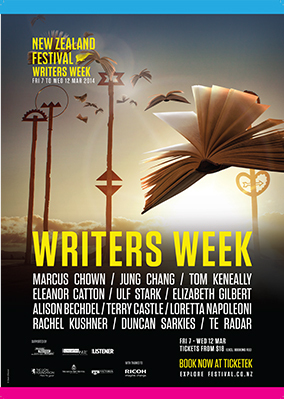 Book fans will be spoilt for choice with free events this Writers Week, including the 2014 Janet Frame Memorial Lecture. Celebrated author and illustrator Gavin Bishop will deliver a literary “state of the nation” at the New Zealand Society of Authors 2014 Janet Frame Memorial Lecture (6.15pm, 10 March, City Gallery) as part of 2014 Writers Week. This annual lecture is free, and will discuss the current state of literature and writing in New Zealand. For over 30 years, the lives of children and grown-up children have been shaped by the books of Gavin Bishop. Introduced by Wellington Mayor Celia Wade-Brown, Bishop’s lecture will focus on the value, standing and role of illustration in children’s literature. As a picture book author and artist, Gavin Bishop has published more than 40 books and won numerous awards, including the Margaret Mahy Medal for Services to Children’s Literature in 2000. He has also written for television and the libretti for two children’s ballets for the Royal New Zealand Ballet. Local visual art fans and aficionados can enjoy a special screening of The Man in the Hat (7.30pm, 11 March, Film Archive, koha), the documentary portrait of influential Wellington art dealer Peter McLeavey, directed by Luit Beiringa. The film explores McLeavey’s early life and the more than 500 exhibitions he went on to curate from his history-making Cuba Street gallery. Beiringa will introduce the screening and be available afterwards to talk about this extraordinarily influential character. Writers Week is supported by Asia New Zealand, Australia Council for the Arts, Canada Council for the Arts, Creative New Zealand, Flemish Literature Fund, Goethe-Institut, Institut Ramon Llull, Lion Foundation, Museum Art Hotel, National Library of New Zealand, New Zealand Book Council, New Zealand Listener, Royal Society of New Zealand, Swedish Arts Council, Unity Books and Victoria University of Wellington.